Today was National Ride2School Day. This is a fantastic program designed to encourage Australian children to ride, walk, scoot or skate to school. In addition, the program organisers believe that children to choose 'active' travel to school will arrive more alert, more attentive and ready to learn. What a great idea! But why just make it today? Why not encourage and even participate in active travel to school with your children? 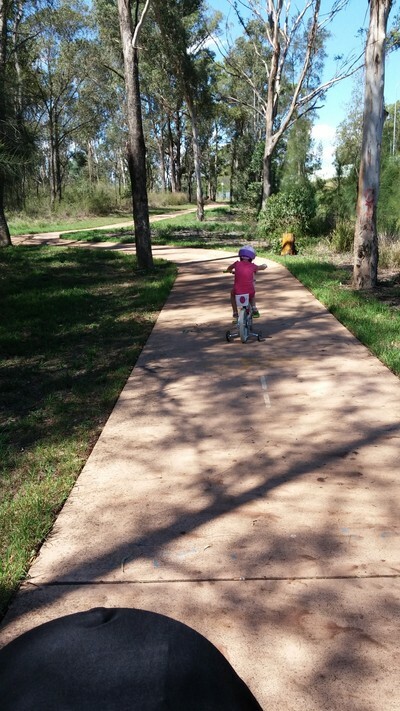 We ride to and from preschool everyday, it's a great way for kids and parents to get active! I live within a 5 minute walk from the local primary school and when my daughter begins kindergarten, we will walk or ride to school everyday. However, I have neighbours living in the same street who drive this very short distance to take and pickup their children from school. What message is this sending their children? I challenge you and your family to make the journey to school an active one, each day. I guarantee you and your kids will reap the benefits. For more ideas on helping to get your kids more active, click here. What activities do your children participate in to make up their 60 minutes of physical activity each day?